US@: 3, 2, 1 – It’s go time! This week felt like a blur. On Thursday, Harry's much-anticipated (next best seller!? 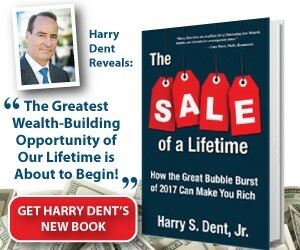 ), Sale of a Lifetime: How the Great Bubble Burst of 2017 Can Make You Rich, was released to the public. If you haven't secured your copy, click here now. What started as a conversation between Harry and me over dinner last December blossomed into what I believe is one of Harry's best works yet. After months of editing (kudos to Teresa and Harry), production (great job Jen S.) and marketing preparation (our entire team), the book is finally in the hands of the people who will benefit most – you, our loyal readers. In it, Harry is on a mission to show you how easy it is to see bubbles (don't listen to all those "experts" telling you there's no bubble… they have an agenda). He starts with the Great Tulip Bubble of 1636 to illustrate the cyclical nature of market bubbles. Tulips were the first modern speculative investment available to investors. Prices skyrocketed 120 times their original value within two years, and by the third year the market collapsed 99.8% to just below where the bubble started. Harry also lays out the current litany of economic accidents waiting to happen – not just here, but across the globe. Any of them could trigger the next financial collapse. Whatever tinder sends the whole thing up in flames, Harry expects the crash to happen no later than next year, with late 2017 seeing the sharpest crash. And before I get another email asking "when will the next crash happen?" I'll tell you right now that it's nearly impossible to predict with 100% certainty since the markets remain artificially propped up by the Fed's cheap money and endless stock buybacks. If we had some sort of crystal ball that could tell us that, let me assure you we'd be living on an island somewhere drinking Mai Tai's, living off our riches. What I will say is that Harry has an eerie track record for being correct most of the time. But the point of The Sale of a Lifetime, and what makes it so different from his previous books, is that he gets you and your portfolios ready for the opportunities available AFTER this next crash. In the final section of the book, Part V, Harry lays it all out in no uncertain terms: How to Get Rich During the Aftershock. Sometimes knowing where not to invest can be as important as knowing where to put your hard-earned cash to work for you… and that's what Harry explains in The Sale of a Lifetime. Throughout the book, Harry uses historical overlays and corresponding qualifiers to nail down each spurious possibility for readers to ponder. All that said, one thing is certain above all else: the situation cannot remain unchanged. Bubbles, by their very nature, burst. The bubbles in the global marketplace today will pop, just like they always have. On Monday, September 12, Harry talked to 5 Day Forecast readers about the warning signs flashing in the markets right now. Friday the 9th hurt. The Dow was off near 400 points in the worst one-day mini-crash since the Brexit fiasco nearly three months ago. Volatility has been virtually absent as the bulls made a run for 2,200 on the S&P 500 – which, by the way, they fell short of. Monday was no walk in the park, either. It looks like the sale of a lifetime could be coming sooner than many expect. John Del Vecchio, our resident Forensic Accountant and Editor of our Forensic Investor research advisory, continues to advise his readers to maintain a bearish bias toward the general market. As he reminds them, the market remains overbought, achieving new highs but on very low volume – a remarkably bearish signal! He repeated this message to his readers on Thursday the 15th. Tread carefully in these waters. The sharks are amassing. On Tuesday, September 13, Charles bluntly told you to max out your 401(k). He then laid out the many reasons why this should be your top priority. Perhaps the biggest motivator for my husband and I (and probably you as well) is so that we don't have to rely on our son to support us in retirement. If that's not the kick in the pants you need to save and invest more wisely for your future, I don't know what is. Charles also mentioned that he's starting to exercise after his wife threatened to spend his life insurance money with her new cabana boy husband when he drops dead. (Too bad he doesn't work with us in our Baltimore office, where classes and personal training are part of the benefits package!) Just last year, Lance (editor of Treasury Profits Accelerator) started Cross Fit – a high-intensity core strength and conditioning program. This weekend he takes it to the next level and competes in his first event. Lance, if you're reading this… best of luck! U.S. consumer spending is strong. Unemployment is at record low levels. And recently, even wages – which had been stagnant for years – have begun to grow. All told, consumer spending stocks have a lot going for them these days. And that includes hotel stocks. They've been somewhat out-of-favor over the last year or two. While the S&P 500 chopped sideways, many hotel stocks worked off price excesses by pulling back between 20% and 30%. But now hotel stocks are trending higher again and many of them have market-beating momentum. Of course, last week's broad-market sell-off hit hotel stocks, as nothing was spared. And there's absolutely no guarantee that the selling is over. But the odds are heavily in our favor for dip-buying at this pessimistic extreme. While we can't share with you the details of the stock that Max Profit Alert subscribers added to their portfolios this week, there is a bigger point that Adam is making. That is, there are always opportunities. You've just got to know where to look. I had no crystal ball that told me that the market would roll over last Friday. But I mention this because it's important to keep things in perspective. We knew it was just a matter of time before the eerie calm of the summer gave way to more normal volatility. So, when that volatility hits, we shouldn't panic. Normal market volatility is nothing to worry about, and our Peak Income portfolio is diversified and attractively priced. Frankly, I welcome a little volatility. It gives us the opportunity to add new money to our existing positions and potentially gives us a bigger selection of income opportunities to snag on the cheap.